One of our readers had the chance to find prebuilt PCs with yet unannounced NVIDIA graphics card. The 16-series, or whatever you want to call them, will launch on February 22nd. The first card named GTX 1660 Ti will offer 1536 CUDA cores based Turing architecture paired with 6GB of GDDR6 memory. These cards are meant to fill the gap between entry-level Pascal series and upper mid-range offer such as RTX 2060. 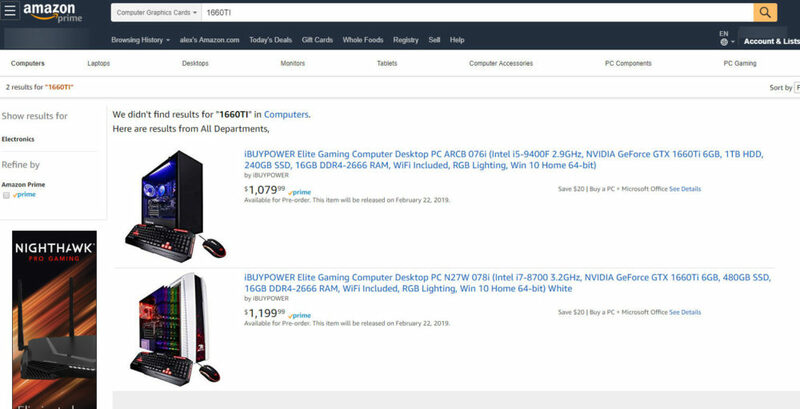 Two systems were discovered on the Amazon website, both featuring GTX 1660 Ti graphics card. One of them features Intel i5-9400F CPU, which lacks integrated graphics solutions. These gaming systems will be available for 1080-1200 USD. Many thanks to doublemonkie for the tip!